About 10 years ago I was discussing with an Elder the pros and cons of a huge decision our church was facing. He ended our conversation saying, “But we’ve got it all under control because all the Elders are fasting.” I looked at him incredulously and said, “Really? You think that will help?” The conversation went downhill from there. Fasting didn’t help these men make a better decision or make them better attuned to the Lord’s direction. The decision they made was disastrous, but it had nothing to do with them fasting or not fasting. These well-meaning and otherwise Godly men were simply incorrectly applying statements in the Gospels, things Jesus said to the Jews under the Law, to people living post-cross in the Church Age. Applying this Elder’s reasoning, it’s easy to see why so many people through the years have punished their bodies trying to get God’s attention. On our trips to the holyland we have often seen people bleeding from beating their backs with whips or crawling on their bloodied knees for blocks, believing that these kind of actions would make God more likely to answer their prayers. But the truth is, there is zero you can do or not do to make yourself more or less acceptable to God. You can’t, but Jesus could, and He paid it ALL on the cross. The phrase “It is finished” is a Greek accounting term meaning “paid in full.” Born-again Believers are as holy as they’ll ever be living in their sinful and temporary container. You can’t add to the righteousness Jesus provided you. He doesn’t need your help. Paul, our Church Age Apostle, never mentioned fasting. 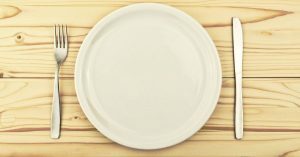 With the exception of a couple of references to people fasting in the transitional book of Acts, it’s not commanded or instructed in the Church Age. They suggest that verse confirms that while Jesus is away we should fast. That’s true for the Jews who rejected their Messiah, to whom this was written. But this verse actually confirms Church Age believers are not to fast because He’s not gone away; He lives in us! Fasting may have some health benefits and I’m obviously referring only to spiritual applications. So it’s not necessarily wrong to fast. It’s just wrong to fast thinking it will make God more likely to answer your prayers or impart more wisdom to you. If you want wisdom, ask for it.